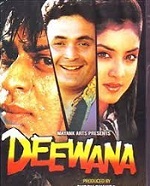 Deewana was directed by Raj Kanwar and co-starred Divya Bharti, Rishi Kapoor, Amrish Puri and Mohnish Behl. Film was a commercial hit and earned INR170 million at box office. Film tells the story of young man falling in love with a widow, but his father is against his love and sends goons to put an end. Protagonist severs his relationship with his father after knowing his foul play. She starts to fall for him and after consistent efforts she marries him. To their shock one day protagonist introduces his friend to her who is none other than he first husband. 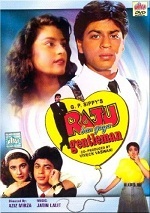 Raju Ban Gaya Gentleman was directed by Aziz Mirza and co-starred Nana Patekar, Juhi Chawla, Amrita Singh and Naveen Nischol. Film tells the story of a young engineering who comes to Mumbai with a dream of making big name in architecture. He is from poor family and having no other connection in new city he spends his first day in a temple. A young girl helps him to get a job as trainee and the couple fall in love. But there is another rich girl who is also falling for him. 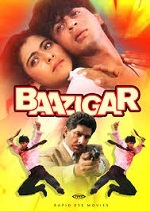 Baazigar was directed by Abbas-Mustan and co-starred Kajol, Shilpa Shetty, Siddharth Ray and Raakhee. Film tells the story of young man who takes revenge for the injustice done to his family. Several years back his father was running a group of successful industries and his manager cheats him and transfers all his property to his name. His father dies in the event and mother loses her sanity. Now the protagonist is a grown up and pretending as a car racer he meets the antagonist and gains his trust. He acts like he is in love with his daughter and regains the property which his father lost. 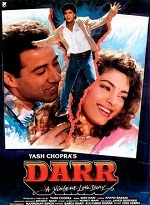 Darr was directed by Yash Chopra and co-starred Sunny Deol, Juhi Chawla, Anupam Kher and Dilip Tahil. Film was made with budget of INR15 million and earned INR193 million at box office. Film tells the story of a mysterious guy madly in love with a girl. The girl is in love with a Navy officer who bravely fought terrorists who held several hostages. But the mysterious guy never reveals his true identity and pursues her everywhere. He even goes to the extent of making several attempts to kill her boy friend. The couple get married and head to Switzerland for honey moon. There also the mysterious man appears and tries to kill, rest of the story is how it ends. 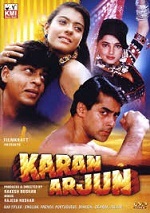 Karan Arjun was directed by Rakesh Roshan and co-starred Salman Khan, Raakhee, Kajol, Amrish Puri and Mamta Kulkarni. Film was made with budget of INR40 million and earned INR530 million at box office. Film tells the story of two brothers who take revenge for the death of his father. There is rich land lord whose son marries against his father and infuriated by this he disowns his son. Land lord’s servant being greedy to get all the property kills landlord, his son and grand children. But the widow still believes that her children are still alive and will come back. Her children are reborn in different family but they have little memory of their past life, rest of the story is how they take revenge. Dilwale Dulhania Le Jayenge was directed by Aditya Chopra and co-starred Kajol, Amrish Puri, Anupam Kher and Farida Jalal. Film was made with budget of INR40 million and earned INR1.22 billion at box office. Film tells the story of two NRIs falling in love in London during their vacation. They are from different family background, her father is a Hindu conservative and his father is a very liberal. But girl’s parents have already chosen a groom for her in India and wedding preparations are going on. Rest of story is how protagonist comes to India and wins the heart of her parents. Yes Boss was directed by Aziz Mirza and co-starred Juhi Chawla, Aditya Pancholi, Gulshan Grover and Kashmira Shah. Film tells the story of young middle class man who helps his office boss in managing his extra marital affairs. His boss married a rich girl not because of love but for her money. Protagonist falls in love with a girl in office and his boss also has feelings for her and asks him to help to trap her in affair. When his boss comes to know about their relationship he fires protagonist and the girl realizes that true love is better than luxury things. Pardes was directed by Subhash Ghai and co-starred Amrish Puri, Mahima Chaudhry, Apoorva Agnihotri, Himani Shivpuri, Alok Nath and Aditya Narayan. Film was a commercial hit and earned INR30 crore at box office. Film tells the story of two cultures meeting together, there is a wealthy NRI living in America and has a son who is indulging himself with western culture and has no memory of his India culture. There is another NRI family, the eldest daughter is very Indian in heart and feels lucky to be an Indian. The NRI decides to get the girl for his son as a bride and rest of the story is about their foster son falling in love with that girl. Dil To Pagal Hai was directed by Yash Chopra and co-starred Madhuri Dixit, Karisma Kapoor, Akshay Kumar and Farida Jalal. Film was a commercial hit and earned INR580 million at box office. Film tells the story of dancing troupe members. The protagonist doesn’t believe in soul mate stories, but his group member who is in love with his hesitates to tell her feelings. One day he comes across a orphan girl who is also interested in dance, she is already engaged to rich guy who is the son of her guardian. Once when his dance group member injures his leg he seeks the help of new girl and subsequently falls for her. 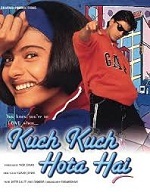 Kuch Kuch Hota Hai was directed by Karan Johar and co-starred Kajol, Rani Mukerji, Salman Khan and Anupam Kher. Film was a huge hit and earned INR1.03 billion at box office. Film tells the story of two college friends. There are two best friends in college who are very close and popular in college. The girl has feelings for guy but he is doesn’t return her feelings and treats her as a friend. One day a new girl joins the college and the guy is attracted to her, this makes his best friend jealous. His friend can’t take it anymore and leaves the college in tears. After the college the couple get married but she dies after giving birth to a baby. Rest of the story is about their baby reuniting the old friends in marriage. Baadshah was directed by Abbas-Mustan and co-starred Twinkle Khanna, Raakhee, Amrish Puri and Johny Lever. Film was a commercial hit and earned INR232.5 million at box office. Film tells the story of a private detective living with his mother. His Baadshah Detective Agency is doing just okay and he is desperately in need of big break. He gets a strange case one day, a rich comes to his office seeking his assistance for his daughter’s marriage. She is cold towards a guy with whom he wants her to marry. Protagonist acts as a blind guy and plays with her to get sympathy, rest of the story is how he falls in love with her and revives his career. 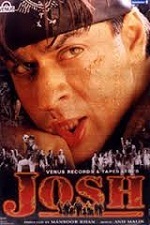 Josh was directed by Mansoor Khan and co-starred Aishwarya Rai, Chandrachur Singh, Sharad Kapoor and Priya Gill. Film was made with budget of INR170 million and earned INR330 million at box office. Film tells the story of two rival gangs in Goa, namely Bichhoo and Eagles. Eagles gang is headed by Protagonist and they always fight each other for silly reasons. One day the opposite gang leader’s brother come to India and falls in love with sister of opposite gang leader. But he keeps his mouth shut because of their rivalry, due to strange circumstances protagonist kills opposite gang leader. 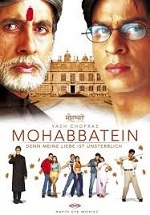 Mohabbatein was directed by Aditya Chopra and co-starred Amitabh Bachchan, Aishwarya Rai, Uday Chopra, Jimmy Shergill and Preeti Jhangiani. Film was made with budge of INR181 million and earned INR741.1 million at box office. Film tells the story of college students in a Gurukul. The Gurukul is headed by a very strict headmaster and never allows any love affairs in his college. Once his own daughter falls in love with a guy but due to his stubborn nature she couldn’t tell it to her father and commits suicide. After several years the protagonist wants to change the attitude of headmaster and comes in disguise of music teacher. 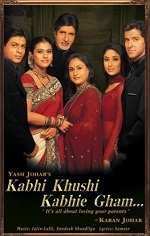 Kabhi Khushi Kabhie Gham… was directed by Karan Johar and co-starred Amitabh Bachchan, Jaya Bachchan, Kajol, Hrithik Roshan and Kareena Kapoor. Film was made with budget of INR400 million and earned INR1.17 billion at box office. Film tells the story of rich businessman living with his wife and two sons. Elder son is an adopted son but nobody knows it except his parents and himself. He falls in love with a girl belonging to a middle class girl but his father is against his love affair and warns him not to go further, but due to strange circumstances he marries her. Infuriated by this his father disowns him and rest of the story is about his younger brother bringing him back. 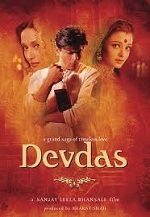 Devdas was directed by Sanjay Leela Bhansali and co-starred Aishwarya Rai, Madhuri Dixit, Jackie Shroff and Dina Pathak. Film was made with budget of INR500 million and earned INR840 million at box office. Film tells the story of law graduate who returns from abroad to marry his childhood sweet heart. His family eagerly waits for his return but when he comes to back he first visits his childhood friend instead of going to his parents this creates jealous in his mother’s mind. Due to the plans of his family the couple break up and he finds refuge in a brothel always drinking. There he finds a girl who is kind hearted and which makes him realize his mistake of leaving his soul mate. At the end he dies at the gate of his married girl friend’s house. Chalte Chalte was directed by Aziz Mirza and co-starred Rani Mukerji, Satish Shah, Jas Arora and Johny Lever. Film was made with budget of INR120 million and earned INR250 million at box office. Film tells the story of young carefree guy falling in love with a rich girl. He is an unorganized guy who never plans his future properly, he is running small trucking company and happy with his life completely. There is another girl who is from rich background and falls in love after few meetings. The couple get married after convincing their parents, rest of the story is about the problems they face after their marriage, misunderstandings, break up and reunite. Kal Ho Naa Ho was directed by Nikhil Advani and co-starred Jaya Bachchan, Saif Ali Khan, Preity Zinta and Sushma Seth. Film was made with budget of INR300 million and earned INR1.3 billion at box office. Film tells the story of NRI living in New York City with her mother, she is a pessimist and finding it hard to run the restaurant business. The protagonist is a highly positive person and is always happy with his life. Story takes twist when audience comes to know that he has a heart problem and counting his last days. There is another guy who is in love with the girl and protagonist decides to unite the couple, he guides him to succeed in his love. Main Hoon Na was directed by Farah Khan and co-starred Sunil Shetty, Zayed Khan, Sushmita Sen and Amrita Rao. Film was made with budget of INR250 million and earned INR250 million at box office. Film tells the story of India and Pakistan relationship. There is an arrangement between two governments to release prisoners of war the project is named “Project Milaap”. Protagonist is an army major, his father dies telling him a secret that he has a brother and mother and asks him to reunite his family. At the same time his senior officer assigns him the responsibility of taking care of his daughter as the terrorists are targeting family of army personnel. He goes to Darjeeling as an undercover cop posing as a student, to his surprise he comes to know that his brother is also studying in the same college. Veer-Zaara was directed by Yash Chopra and co-starred Preity Zinta, Rani Mukerji, Manoj Bajpayee and Divya Dutta. Film was made with budget of INR250 million and earned INR942.2 million at box office. Film tells the story of Indian Air Force pilot falling in love with Pakistani girl. Girl comes to India in order fulfill the last wish of her beloved and her bus meets with an accident but she was rescued by a protagonist. He falls in love with her and takes her to meet his parents, when she goes back to Pakistan she also finds it difficult to live without him. Protagonist goes to Pakistan to get his love but due to her father’s political influence he ends up in jail. Swades was directed by Ashutosh Gowariker and co-starred Gayatri Joshi, Kishori Balal, Rajesh Vivek and Makrand Deshpande. Film was made with budget of INR210 million and earned INR343 million at box office. Film tells the story of NRI who worked in NASA returns to India and meets very interesting people like postmaster, freedom fighter, a cook etc. While in India he comes to know several aspects like poverty, caste discrimination, illiteracy, child labor, child marriage etc. He has the dream of building a small hydro-electric power plant in the village to make self-sufficient. Kabhi Alvida Naa Kehna was directed by Karan Johar and co-starred Amitabh Bachchan, Abhishek Bachchan, Preity Zinta, Rani Mukerji and Kirron Kher. Film was made with budget of INR500 million and earned INR1.13 billion at box office. Film tells the story of soccer player living in United States. He is living with his wife, son and mother. There is another girl who meets the soccer player before marrying and they instantly connect emotionally. Soon the soccer player loses his leg in an accident and develops inferiority complex towards his wife because of her successful career. Rest of the story is about failing marriage, extra marital affairs etc. Don was directed by Farhan Akhtar and co-starred Priyanka Chopra, Isha Koppikar, Arjun Rampal and Boman Irani. Film was made with budget of INR350 million and earned INR1.05 billion at box office. Film tells the story of drug lord in Malaysia, he is of Indian origin and Malaysian police seek the help of Indian authorities to catch the drug lord. Indian senior police officer goes to Malaysia with his crew and in a car chase the drug lord was shot dead. But the authorities aren’t happy with his death because there are other influential people behind the drug mafia who go unpunished. Indian police comes with a brilliant idea of replacing drug lord with look-alike person from Mumbai. Rest of the story is how this duplicate gangster successfully completes his mission. 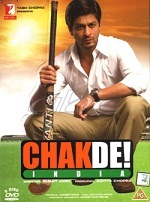 Chak De! India was directed by Shimit Amin and co-starred Anjan Srivastav, Javed Khan, Anaitha Nair and Tanya Abrol. Film was made with budget of INR240 million and earned INR1.05 billion at box office. Film tells the story of former Indian hockey team captain. A match between India and Pakistan changes his life forever, he loses a goal by mistake and whole national media interprets it as a match fixing and blames the captain for losing the match. Seven years later he comes back to hockey as a coach for Indian women’s hockey team. Rest of the story is about how he is able to lead the team to championship against all odds and predictions. Om Shanti Om was directed by Farah Khan and co-starred Arjun Rampal, Deepika Padukone, Kirron Kher and Shreyas Talpade. Film was made with budget of INR350 million and earned INR350 million at box office. Film tells the story of a junior artist struggling a lot to establish himself in Bollywood. There is an actress who treats him with respect and he is in love with her but she is already engaged to Bollywood superstar. She is already pregnant with superstar’s baby but when he comes to know about the baby he insists her to get abortion, but when she doesn’t agree he kills her mercilessly by setting fire on the film set. While saving the actress protagonist dies and takes birth in a rich filmy family. Rest of the story is about how he takes revenge against antagonist with the help of ghost of his lover. Rab Ne Bana Di Jodi was directed by Aditya Chopra and co-starred Anushka Sharma, Vinay Pathak, Manmeet Singh and M.K. Raina. Film was made with budget of INR200 million and earned INR1.58 billion at box office. Film tells the story of an office employee marrying a girl and trying to win her heart. The girl is already in love with a guy but he was killed in an accident, her father is in death bed asks the protagonist to marry her. Out of respect for his teacher he agrees to marry her and she too agrees reluctantly. But she is never happy with his simple personality, she always find Bollywood heroes attractive. Now the protagonist disguises himself as “Raj” to impress her, rest of the story is how she falls in love with her real husband. 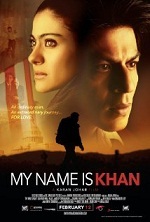 My Name Is Khan was directed by Karan Johar and co-starred Kajol, Jimmy Shergill, Zarina Wahab and Pallavi Sharda. Film was made with budget of INR38 crore and earned INR200 crore at box office. Film tells the story of Muslim family whose life is changed after the September 11 attacks in USA. Single mother raises her two sons in on her own in Mumbai, her elder son is very intelligent and has very gifted brain but younger son feels jealous of him and runs away from home. After the death of his mother younger brother starts to live with his brother. Elder brother is married to a Hindu. Rest of the story is how the society turns hostile towards Muslims after September 11 attacks in USA. Ra.One was directed by Anubhav Sinha and co-starred Arjun Rampal, Kareena Kapoor and Armaan Verma. Film was made with budget of INR1.25 billion and earned INR2.4 billion at box office. Film tells the story of Indian game designer, he developed a new motion sensor based game in which the antagonist is more powerful than the protagonist. Antagonist comes out of game to real life to kill the son of game developer because he is the only person ever to defeat antagonist. Now the family brings out the game’s protagonist into reality to protect their family. Don 2 was directed by Farhan Akhtar and co-starred Priyanka Chopra, Lara Dutta, Boman Irani, Kunal Kapoor and Om Puri. Film was made with budget of INR750 million and earned INR2.06 billion at box office. Film tells the story of gangster who is now controlling the whole Asian mafia but now he is planning to expand his business to Europe. The European mafia leaders meet to discuss about their business losses in Asian region, they come to the conclusion that the Asian gangster is playing foul to make money and hence they decide to kill him. They plan to frame for drugs and he beats up the goons but surrenders before police. Rest of the story is about he escaping from prison and robbing currency plates. Jab Tak Hai Jaan was directed by Yash Chopra and co-starred Katrina Kaif, Anushka Sharma, Anupam Kher, Neetu Singh and Rishi Kapoor. Film was made with budget of INR600 million and earned INR2.40 billion at box office. Film tells the story of Indian Army officer who defused several bombs putting his own life in danger. One day a girl working in Discovery Channel falls into river and the Army officer saves her. While he leaves the scene the girl finds a diary in the jacket he gave her. Rest of the story is the girl reading his diary and finding very interesting stories of his life. Chennai Express was directed by Rohit Shetty and co-starred Deepika Padukone, Sathyaraj, Nikitin Dheer and Kamini Kaushal. Film was made with budget of INR750 million and earned INR3.95 billion at box office. Film tells the story of a man from Mumbai falling in love with daughter of local don in Rameshwaram. Protagonist loses his parents in a car accident and he was raised by his grandparents. His grandfather’s dies on the eve of his 100th birthday and his grandmother tells him the last wishes, he wanted his ashes to be divided into two parts and immersed into both Ganga and Rameswaram. While going to Rameswaram he meets the heroine and rest of the story is he saving her from goons. 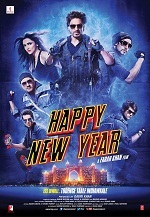 Happy New Year was directed by Farah Khan and co-starred Abhishek Bachchan, Deepika Padukone, Sonu Sood, Boman Irani and Jackie Shroff. Film was made with budget of INR125 crore and grossed INR150 crores in just one week. Film tells the story of a street fighter who is planning to take revenge for 8 years. Antagonist framed protagonist’s father for a crime which he didn’t commit. Now the street fighter wants to take revenge in the same way, he wants to steal diamonds and frame antagonist for the theft. He assembles his own team from different backgrounds and successfully traps him.